G.H.O.S.T Club SG's 3rd expedition takes us to the hunt for Pontianaks from the infamous Sunset Way, an abandoned railway track very near to civilization and located within the Clementi neighbourhood. It will also take us to explore the quiet and lonely stretch of road off Old Holland Road. 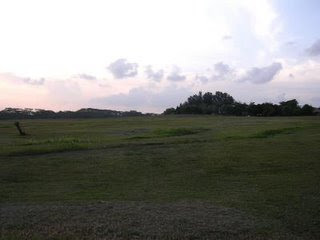 Finally, as a finale to the Kent Ridge Park saga, we will revisit the place once again to see if we are able to dispel any myths and/or make sense out of our previous experience there! This time around, we have an experienced team comprising of (from left) myself, Agent Maxwell, Agent Gilson, Agent Goatie and Agent GQ. Even before setting off for our expedition, we are already greeted by a friendly orb hovering above us!! Resident ghost from Block 437 perhaps? In day time, Sunset Way is a seasoned and cosy neighbourhood that houses residents for more than 30 years... Located within the Clementi neighbourhood and overlooking a canal, this area is a favourite place for joggers, elderly residents taking a stroll and youths hanging out and fishing beside the canal. It is also surrounded by lush greenary and private houses, hence making it a serene and peaceful place to be as a getaway from the hustle of the main central area. 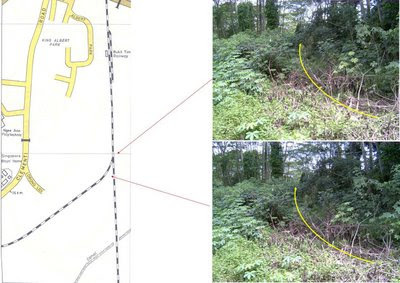 Located within this neighbourhood is a stretch of abandoned railway tracks that is clearly visible during the daytime. The most obvious point of the track is the bridge that extends out of the jungle and across the canal further off Clementi Road. 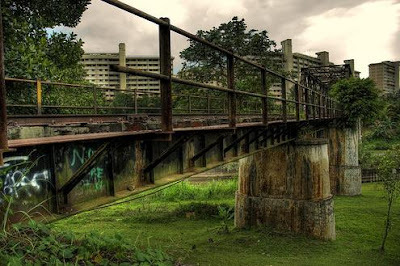 Built in the 1960s by the Keretapi Tanah Melayu as part of the Jurong Line that extends from the Tanjong Pagar Station, this railway line served as a transport channel for raw materials coming from the Malay Peninsula that was intended for factories in the West. However, it was not extensively used and several years later, the track was closed as it was not economical to run the trains along the lines. And since then, it was left abandoned. Today, rust has set in on most parts of the tracks, giving it a gloomy and old look to it. The tracks have since found its own life, being a scenic spot for wedding pictures and a favourite haunt for nature lovers and trekkers. At night, the tracks also take on a life of its own. It is plunged into spooks and darkness. Youths who fish nearby sometimes report strange screaming sounds from the railway tracks, while others who explored the place at night report of Pontianak sightings. A youth I know related his own accounts of how he and his friends used to explore the place at night, and they fell asleep there, only to be woken up by a woman's voice. They awake to find a Pontianak standing beside them, looking at them. They bolted and ran away, only to hear a horric laughter behind them. The stories, while claimed to be true accounts, remained a little too incredible and somewhat exaggerated for our liking. Hence, we decided to dispel the myths and stories behind by having our own explorations. We reached Sunset Way past midnight, parked our car near the HDB block, and walked towards the tracks. It was amazing how echoes of sounds can be heard all over the area, sounds of people talking from the blocks, clinking sounds from the kitchen, TV sounds etc, it all points to a high possibilities that when you are up on the tracks, you may be hearing sounds coming from the nearby HDB blocks. The place was also pretty bright as lights from the HDB blocks and streetlamps from the roads illuminated the tracks. Our only threat was the slippery slopes that lead up to the tracks as it was raining earlier on. Slowly we reached up onto the tracks itself. Up here, it is really so dark that we can hardly see anything within 5 metres ahead of us. Worse still, there are actually alot of dangers, not so much from the paranormal realm, but the physical one instead. The track is filled with the ocassional broken slabs that exposed a hole. If not careful we can plunge through the hole and below us is the canal. The railway bridge stood at least 6 storeys high from the canal below, and some of us were already getting height phobia just looking down through the holes...I took the lead in walking, as the rest of the team were gingerly moving forward. Perhaps the trainings in army helped ease any fear of heights. An orb appeared in the top right hand corner of the first picture I took of the railway track, but nothing much to feel or see. The further we walked along the tracks, the deeper we seem to go into the forest. The tracks also became less and less visible, as the grass had grown to cover the tracks...see if you can spot the faint outline of the track in the picture below. The surroundings became more and more quiet, the air getting slightly heavier. There was little talking, not sure if everyone was starting to feel the change in the atmosphere, but we trooped on slowly. Seem to resemble almost a human face when zoomed up close. What is intriguing is that there weren't any reflective surface around and little chance of light reflection. And the place is so dark, if it was a dust particle, it would not also turn up as a reddish glow. And this picture was taken just as I was starting to feel the atmosphere changing and the air becoming thicker. Unfortunately other than this picture, I did not see or hear anything that I could tie back to this strange reddish orb. As such, we can only dismiss the picture as inconclusive. The surroundings continued to look spookier by the minute. But actually as we moved on, the atmosphere improved, and the air thinned out as well. Perhaps it was only at that particular stretch where the reddish orb appeared that may suggest some form of paranormal activity. As we walked on, we were actually walking further and further away from the car, meaning that we have to walk all the way back to our vehicle if we continued to move on. The track supposedly will lead all the way to the Tanjong Pagar Station, but no way we will walk all the way there! We stopped at one part of the track, after having walked for almost 1 km we reckon. We started to discuss what is the possible routes that this track will lead to...probably Bouna Vista and then towards Bukit Merah and finally cutting through to Tanjong Pagar. But we weren't sure. An online research after the expedition revealed that this is probably how the track looked like in the form of a map in the 1960s...We decided to finish our exploration of the Sunset Way railway tracks roughly at this point, as rumours has it that it is within this area that Pontianaks were sighted. Further down would be another locality already. And just as we were walking back to our car, we heard a loud single shriek, it jolted all of us and we were stunned. We started asking each other what it was. Is it a car screeching? Didn't sound like. Agent G said it could be a dog, but it sounded louder than a dog, and the sound actually caused a dog to start barking. No....it didn't sound like a dog. What was it? Certainly not human, neither is it a car or an animal. We actually caught it on ou digital voice recorder. After multiple reviews we are unable to ascertain what it was still. Was it a Pontianak making its presence known right at the end? Section of the road was still visible by the classic white line that separates roads in Singapore. But somehow, the sides of the roads are engulfed by the grasslands, making the road look really small. We moved on slowly, and kind of gingerly as we are unable to see what is ahead. We had a tense feeling, as if expecting that something was going to appear in front of us at any moment! The road gets darker and darker as we ventured deeper and deeper in. Nobody really said a word. We only took some pictures. It was indeed a little eerie. As we were walking, although everything remained quiet, I have that feeling of being watched, by things on the left hand side of us, among the trees and bushes. It was an uncomfortable feeling but nothing to threaten a turn back, so we continued walking on. At one point of time we captured an orb appearing on the right hand side of this picture. Who is watching us? I can imagine they are thinking what are 5 people doing in this part of the land at this hour. It was at this instant when Agent Goatie said he heard sounds from a distance away, along the huge piece of grassland. We all turned to our right and listened. There was sounds no doubt, some of us thought it was a woman crying, while I heard more like a series of strange, unrecognizable voices or tones. We all had the same conclusion that the sound was pretty far away from us, in the general direction opposite of where we were heading but there was definitely something or someone in the field. So we decided to u-turn and walk back to explore this sound. Unfortunately our investigation yielded nothing. No one, not even any animals were present in the direction where we had heard the sound. We just kind of dismissed it. And somehow none of us actually talked about continuing our walk along the abandoned road. 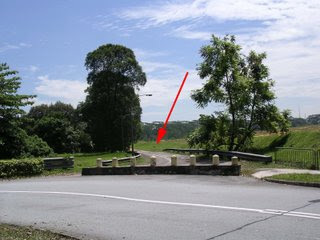 According to Mr Lam, he mentioned that beyond this barricade is a road that used to be called Holland Lane, and it actually leads to a Chinese cemetry and a temple at the end. Now that it is closed, the place becomes even more creepy and eerie. Could this explain why I felt that things were watching us as we walked down the road? Research on the National Archives collection also revealed that a Chinese Temple indeed exists beyond the old abandoned road! After exploring Old Holland Road, we headed onto Kent Ridge Park for a re-visit! We were determined to see if the expedition the other time was indeed paranormal, or perhaps if there were signs of the poles shaking and clinking again today, it will probably end up that what we witnessed that day was just something that happens every single night. So the key objective was to be able to validate what we had witnessed the other time. With anticipation, we drove to Kent Ridge Park. The time was about 2 plus am, almost the same time that we had explored the place the other time! Somehow as we reached Kent Ridge Park, the place was littered with people, much more people today, than the last expedition. There were motorbikes, people chatting, laughing, having supper at the wooden benches and tables, the air was thick with civilization. We made our way down to the infamous parade square. Even as we made our way down, the air was thinner and the place just looked generally brighter! We noticed that there were in fact more park lamps that were lit today, compared to the other time! That made us ponder. The park lamps usually work on a timer and their light will be on the same time every night. And even if it is working on power saver mode, it will off itself once in a while and re-on back again after some time. The lamps that were lit today were not lit on that fateful night. We stayed at the parade square for about an hour and the lamps remained lit. Did something sinister really was there that day and it had the power to control the lights? At one stage of time, me and Agent Maxwell felt that there were actually some things with us, just as we started asking questions, they were kind of hidden behind the trees, harmlessly looking at us and wondering what we are doing. They were simply 'watching us'. At times they will move from place to place, as we have both felt, but they were probably not compelled to have the need to show themselves to us. Perhaps lost soldiers from the past, but nothing sinister compared to that experience that night. Out of boredom that we were not getting much response, Agent Gilson gamely posed at the poles, and waited to see if anything happened. Nothing. We placed the EMF reader right at the center pole and 'requested for the entity' to up the reading if it is around. Nothing too. What was baffling was that the wind tonight was stronger, much stronger than that night, but none of the poles moved even an inch. It made the experience we had even more conclusive that something paranormal happened that night. If our hypothesis that wind caused the pole to shake, it would definitely shake now. But it didn't. Agent Gilson even went forward to shake the center pole, in an attempt to create some kind of paranormal response or perhaps infuriate whatever it was, in a respectful manner though. But again, no response. After an hour of being there, we concluded that whatever that happened during our last expedition was something definitely not explainable and certainly adds concrete that it was a paranormal experience. In the first of its kind, GHOST CLUB SG can certainly conclude with strong convictions that Kent Ridge Park is indeed haunted, after the 'lack of activity' and inconsistencies experienced in our numerous trips here. And with this it ends an interesting Expedition 3 (Part 1) for the Club! Stay tuned for Part 2 coming up next!